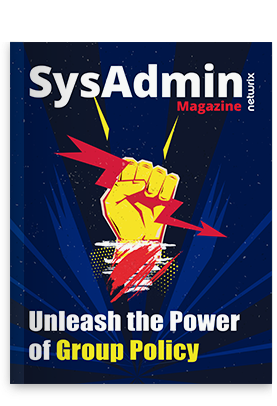 Interest and intended use of Active Directory reporting tool revealed that slightly over 1/3 of respondents care about who made changes in their Active Directory because of multiple administrative accounts. 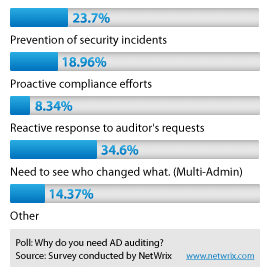 Roughly 24% and 19% of those responding indicated that security and compliance respectively were the primary motivations behind searching for a tool to audit changes within AD. Only just over 8% shared their interest was due to a reactive request from auditors. The remaining 14% cited miscellaneous reasons for auditing AD changes. Fortunately, 19% do indicate that proactively auditing AD for compliance is a priority demonstrating that changes internally at these organizations point to a greater desire for preparedness should there be an audit. When comparing those responding to an auditor’s request (8%), it’s clear that more administrators are placing greater emphasis on auditing in advance rather than to a reactionary situation. This shift will continue to grow towards being prepared and away from reactive measures as more organizations observe the benefits of using auditing as both a compliance and effective management tool. Native AD auditing is cumbersome and can be resource-intensive. What the respondents indicate is a need for greater visibility and demand for better tools that are easier to use. Simplifying the collection and reporting of AD changes positions organizations to improve current auditing measures or start with a solid foundation for the future as the need for effective auditing continue to grow in importance. NetWrix Active Directory Change Reporter is a single tool to audit and report all changes within AD that is simple to use and easy to setup. Two other interesting results coming soon – subscribe to NetWrix RSS feed to follow. Are you auditing Active Directory, to what extent, and what were your motivations? Please share your thoughts below.